If there is one thing I've learned, it’s to be flexible, generous and kind to yourself, and to build a support system. Being an artist is challenging. Being a parent is challenging. Mash those two together and it can create a beautiful and exhausting existence. I am the predominate caregiver to our now almost 1-and-a-half-year-old. I do work, but part-time (about 20 hours a week). I'm extremely lucky as I can make my own hours; I teach drawing at a local museum and am also a hairstylist. I'm equally as lucky to have the full support of my partner who typically works 70 hours a week and still takes care of our daughter on the weekends, when I usually teach and schedule clients. I cannot stress enough how important his dedication to our relationship, my art career and our daughter (on top of his work hours) is to providing me mental space and time to keep my practice active. 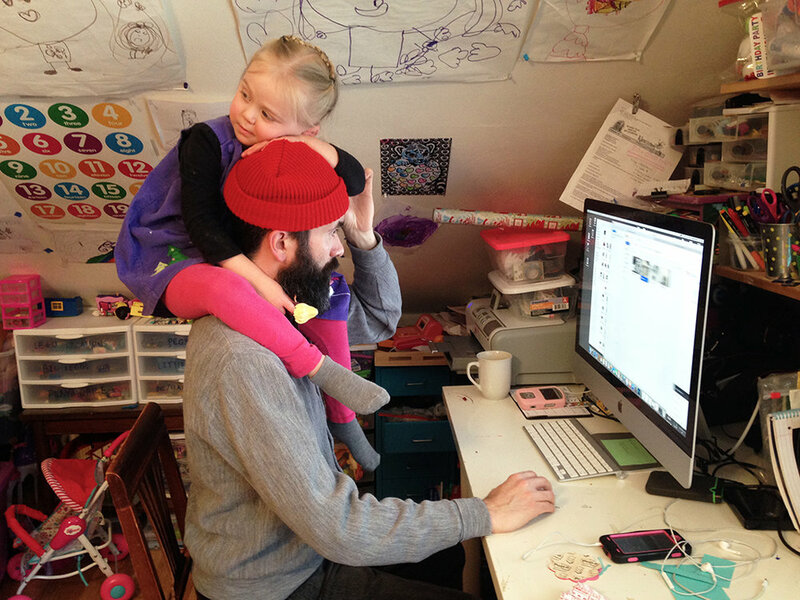 I generally work in the studio during nap time (my studio is at home in the garage) or when I and a fellow artist friend exchange childcare for studio time (she also has a daughter about the same age). We usually do this about twice a week. For the past couple weeks, I've also started hiring a babysitter for a few hours once a week, as I have a big deadline (I have work in a biennial in Slovenia in June) and need more studio time to get everything done. The extra help has especially been needed, because our daughter is currently going through dreaded sleep regression, which has really cut into my nap/studio routine. In general, we do not regularly use childcare because of the cost. However, the sitter and I were recently discussing bartering hair services for childcare, which I love the idea of! Its hard. There are times when there are a lot of tears (and not just the baby's). But there are also times when I feel even more motivated because of all the things I have to juggle. I've learned to embrace and recognize how parenthood has affected my work. I work serially and currently have two newer projects I am developing, one of which focuses on my experience of the sort of temporary erasure of one’s individual identity when you become a parent for the first time. In this performance-based series—entitled not her(e)—I become camouflaged and a part of the furniture. So much of being a caregiver is about being used as well as being invisible. So far, I have completed four “furniture costumes.” Ideally, I would like to create “furniture costumes” for all the pieces of furniture in my home that I use daily when taking care of my daughter. I am excited to see how these “furniture costumes” will evolve and if the performances may begin to include other caregivers as well. I am also interested in how structures of power are set up to produce this particular dynamic of childcare. On one hand, I feel very lucky and privileged to be able to be the primary caregiver to my daughter. And on the other hand, I find my situation problematic. Two very contentious facts come into play: student loans and gender/occupation salary inequality. I am interested in the duality in feeling grateful, yet uneasy as we begin to tumble into such normative roles. More than anything, I feel it is important to acknowledge my position of privilege to be able to be a practicing artist and full-time parent, while also acknowledging the amount of drive it takes to stay motivated, informed and intentional; I am conscious that the content of the work I put forth as an artist needs to continue to be as conceptually rigorous as it was prior to parenthood, while also being informed by it. Kaitlynn Redell is a visual artist and educator whose work explores race and gender in relation to the body and how the body becomes codified within these socially constructed categorizations. More specifically she is interested in inbetweeness and how “unidentifiable” bodies—that do not identify with standard categories—negotiate identity. She lives with her 1.5 year old Rosie, partner Tony in Altadena, California. She has been an Artist-in-Residence-in-Motherhood since 2015. See her work at kaitlynnredell.com and redelljimenez.com. My partner and I are both artists. I have found that there are many, many upsides to this, actually too many to count, but a humongous downside is the money problem. In addition to living on credit cards, we also have incomprehensible loads of debt from our private art school education, undergrad and grad school. We have been looking for full time work in the arts that will support our family for years. Its a struggle, and its incredibly disheartening. As we fight to keep making work and also support our two children, ages 4 and 6, we are very fortunate to be able to live with my parents rent-free. We have carved out a space for ourselves in the room above the garage of their house. We call it “The Benny Room”, named after our cat who recently passed away. Our living situation, our lifestyle, is strangely depressing and magnificent at the same time. All of our clothes, all the kids’ toys, craft supplies, our dining table, a kids table, a coffee maker, a mini fridge, a toaster oven, all of our food, a computer, a printer, a tv, and a couch (and much more) are crammed into this small slanty-walled space. Most of the things we own are hand-me-downs or thrift store purchases. About seventy-five percent of our belongings from the thirteen years we lived on or own before having children are being stored in my parents’ attic. Our bedroom is another room in my parents’ house that the four of us share. It is on the other side of the house beside my parents’ bedroom. The setup consists of three mattresses on the floor; a queen in the center and a twin bed on each side, that reach from one wall to the other. The entire floor is basically a mattress. My kids also call it “The Bouncy Room”. The closet in that room spills out with our art and art supplies. We also get to use the yard that the kids can play in and they get to see their grandparents every day. Because we are only working as adjunct professors part-time we are able to spend a good amount of quality time with our kids. I value this aspect of our lives more than anything else. Its really unbelievable and amazing that we get to enjoy our kids and bond with them as much as we do. Many people with successful careers, homes of their own, and loads of money don’t get to do this. I don’t take this aspect of my life for granted. And in our strange, scary, nightmarish, beautiful life of contradiction we have some time to make art. The Benny Room, where we stay during the day, often functions an art workshop for all of us. Our limited wall space is almost completely covered in our kids’ drawings and paintings, thumb-tacked salon-style like wallpaper. And the work all four of us make influences each other as artists. My daily interaction with my children in this house inspires the body of work I have made since my second daughter was born. In photographs and videos I explore my understanding of motherhood as it relates to my maternal legacy that was passed on to me, and I use the setting of the home we are living in as the context for our interactions. I grew up in this house as well and my past and how I was raised is embodied here. I am redefining this space as an adult with my own children, but it is still haunted by the past and the legacy of motherhood that I inherited. I don’t consider this my house, it is my mother’s house, and the awkward way we fit inside it and relate to it is an important part of my artwork. The whole house is my studio, and the space I’m working in changes depending on what piece I’m working on. However, because the house is not mine I cannot take up any common space with my supplies or work for more than a few hours at a time. I make the artwork when my parents are out of the house so as not to inconvenience them. I also consider my process of performance one that is emotionally draining and extremely personal so I only work around my partner and children, who are integral to the creation of my work as well. However in the planning stage as well as the post-production stage of photo/video editing I often have to work alone in order to think straight and get anything done. My partner makes his paintings on my parents’ enclosed porch when the weather is bearable, or otherwise makes small drawings or watercolors on our dining table. When its it’s possible my partner and I take turns giving each other time to work during the day. He also works in the early morning before the kids get up and I try to work at night after the kids have gone to bed if I’m not too exhausted. During the rest of the time our kids are home a great deal since we can’t afford childcare and they aren’t old enough to go to school full days. Our four year old is only in school three mornings a week. Luckily though, when both kids are home they are close enough in age that they often entertain each other when my partner and I have to get other things done and watch them at the same time. And when all else fails, we may even employ the magic of “screen time” to give ourselves the chance to do what we have to do during the day. I wanted to share my experience because I believe situations like ours, in which both parents are struggling artists, are rarely spoken about. This lifestyle, while we have gotten away with it for a period of time, is not sustainable of course. We are approaching middle age and we have no financial stability and no back up plan. We don’t really fit in society, and it amazing that we've gotten away with it as long as we have. As much as I wish we could support ourselves, I am very thankful to my parents, for allowing us to live in their home. I don’t know what we’d do without their support. This was not our plan but we are making the best of it and most importantly, we are continuing to make work.